Review by AllTheBestFights.com: 2016-07-30, some good single shots between Tony Harrison and Sergey Rabchenko but it is not enough to get three stars: it gets two. Tony Harrison entered this fight with a boxing record of 23-1-0 (19 KOs=83%) and he is ranked as the No.15 middleweight in the world. He suffered his only defeat last year against Willie Nelson (=Nelson vs Harrison), after this bout he has won over Cecil McCalla (=Harrison vs McCalla) and Fernando Guerrero. His opponent, Sergey Rabchenko, has an official record of 27-1-0 (20 knockouts) and he entered as the No.55 super welterweight. He lost to Anthony Mundine in 2014 (via split decision, Mundine vs Rabchenko) but then he has beat Walter Osvaldo Gaston Calvo and Miguel Aguilar. 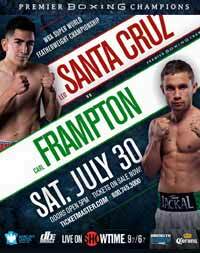 Harrison vs Rabchenko, IBF light middleweight eliminator, is on the undercard of Leo Santa Cruz vs Carl Frampton. Watch the video and rate this fight!